The United States may deploy the F-35 Joint Strike Fighter in the fight against Islamic State of Iraq and Levant (ISIL), a U.S. Air Force general said. “There’s no reason to suppose that the F-35 stealth fighter will be sent to fight in Syria within the next few years. But it’s likely that these planes will join F-22 Raptors in the fight against ISIL,” Gen. Robert Carlyle told Aviation Week. 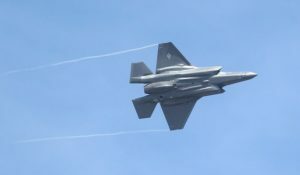 Carlyle made the comments after confirming that the F-35 is expected to be declared ready for combat by Aug. 1. “If the U.S. head of CENTOM and the commanders of other military groups ask, and if it is decided that the F-35’s abilities are needed in this battlefield, I will decide whether to place the aircraft in the arena,” Carlyle said.